It’s Wednesday, so it’s time for another lesson. 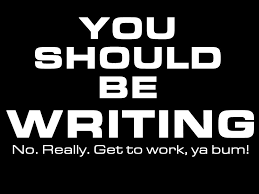 This week, we’re talking about making yourself write. I’ve talked about this before, but I feel like it’s a good reminder for everyone — namely, me. I’ve been doing…well, absolutely nothing this week. Shame on me, I know. We all have those days when we just don’t feel like writing. I know how you feel. I’ve been there, done that. It’s not fun, and we just don’t even want to look at our manuscript. It’s been happening all week to me. Make sure you write. Even if you don’t feel like it. It may feel forced, and it may be obvious that it’s forced. That’s what editing is for. Shocker, I know. Like I said, I’m guilty of not doing anything this week so far, and I’m hoping I get back into it on Friday. Maybe, just maybe, I’ll actually manage to get back into it. I guess that’s about it for this week. Stay tuned for next week!